Sturdy hard plastic vise holds Citizen watch bands of any thickness firmly so pin can be removed with pusher. Repair tools for Citizen Watches. 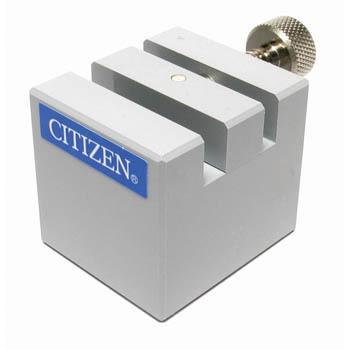 Citizen Watch Band Vise holds any thickness bands. Sturdy hard plastic vise allows the watchmaker to use a pusher to remove bracelet pins.